What Is Acid Peat Moss? Acid peat moss, also called sphagnum peat moss and just plain "peat moss," is a moss that is highly useful to gardeners who are trying to grow healthy, happy plants in alkaline soil. While some plants love a basic gardening medium, most prefer some acidity. So if you are going to try to grow ornamentals, for example, in central Texas, then you can use acid peat moss to make your soil a happier place for those plants to call home. Acid peat moss has a large cell structure that enables it to absorb air and water like a sponge. This helps soil because the peat moss also holds onto nutrients that would simply wash out in a heavy rain. In addition, acid peat moss has a pH of 3.6 to 4.2. Of course, this is far too acidic for most plants, but when you spread the peat moss on the soil in the form of fertilizer, it can bring a soil's pH down to a more pleasant level for your plants. Generally, acid peat moss is spread on top of the existing soil, or living acid peat moss can be "hand dug" into patches in the garden. Moss generally cannot take over a healthy plant's space, so you should not have to worry about losing your flowers to this moss. Just dig the moss a nice, shallow space -- about an inch deep -- and place it in the soil. You can also purchase acid peat moss mulch. Acid peat moss comes in two colors -- tan and brown. Nearly all of it is imported from Canada and Europe. You can purchase acid peat moss in plots that you can lay like sod, or you can use it in the form of mulch if you are more worried about the pH of your soil than its ability to retain nutrients. Acid peat moss makes the soil a more acidic medium for your plants to live in. It can also hold onto nutrients if the soil is dry and prone to "washing out" when it rains. Acid peat moss is also a fully natural way to change your soil's acidity levels and does not come with the risks that chemical modifications might. When you opt to use acid peat moss in mulch, remember that your mulch may need supplemental fertilizers. While the moss will help hold onto nutrients, it does not, itself, contribute to the nutritional health of your plants. Make sure that you are giving your plants enough nitrogen, iron and other important minerals via fertilizer or other methods. Why Does Moss Grow Close to the Ground? How Do I Kill Moss in My Flower Bed? Why Is Moss Growing in My Lawn? Should I Put Lime in My Vegetable Garden? 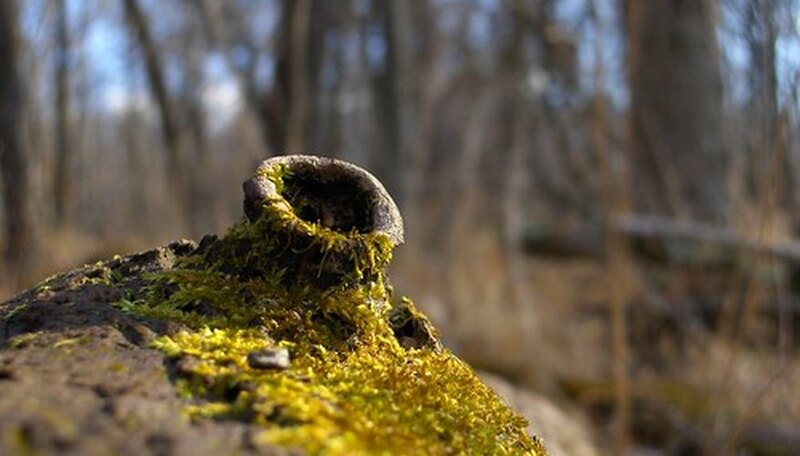 Does Soda Ash Kill Moss?